American University’s School of International Service (SIS) celebrated the graduation of its inaugural IR Online cohort on Sunday, May 10. Over the course of their program, the ten graduates were based in countries across the globe including Afghanistan, Belgium, Cambodia, Egypt, and Qatar. 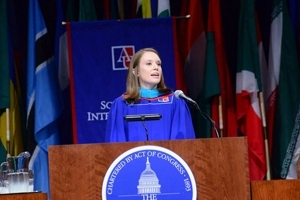 Seven of them joined together on American University’s Washington, D.C. campus to participate in graduation ceremonies alongside the School’s more than 600 on-campus graduates. IR Online launched in May 2013, making SIS the first top-ten ranked school of international affairs to offer a graduate degree fully online. The program has enrolled more than 150 students since inception and was created as a flexible option for high achieving mid-career professionals as well as for those interested in beginning a career in international relations from anywhere in the world. Students participate in live weekly class sessions utilizing its partner 2U’s cloud-based interactive platform. Students enrolled in the IR Online program can pursue concentrations in United States Foreign Policy and National Security, International Negotiation and Conflict Resolution, International Development, or Global Security. For more information about International Relations Online, visit ironline.american.edu or call 1-855-306-AUIR.